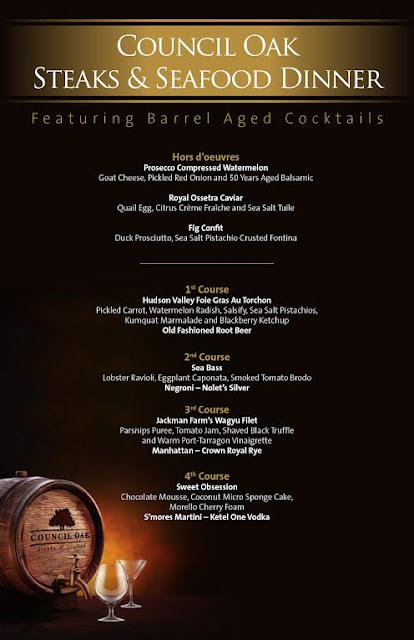 Seminole Hard Rock Tampa is hosting a Barrel Aged cocktail dinner at Council Oak on Thursday September 24th. This is going to be a one of a kind evening filled with...you guessed it - Barrel Aged Cocktails! The night will begin with a themed cocktail reception, followed by an innovative Barrel Aged Cocktails-curated four-course meal at 7 p.m. I have been to a few Council Oak themed dinners before and they are phenomenal events. Here are two links to previous dinners I've experienced at Seminole Hard Rock Tampa: Grand Marnier Dinner at Council Oak and Jack Daniels Dinner at Council Oak. After reading the menu, I am not sure what I am more excited for. This is going to be a one of a kind meal. The featured barrel cocktails are: Old Fashioned Rootbeer, Negroni – Nolets Silver, Crown Rye – Manhattan and S’mores Martini – Ketel One Vodka. Each guest who attends will receive their very own commemorative 2-liter Barrel Aged Cocktail (Barrel and Cocktail)!! The entertainment will be provided by Samantha Leigh. Tickets (at $245 per person) are available for sale by calling Council Oak Steaks & Seafood (813-627-6630).